Suddenly, research findings require a paradigm shift in our view of the microbial world. The Human Microbiome Project at the National Institutes of Health is well under way, and unprecedented scientific technology now allows the censusing of trillions of microbes inside and on our bodies as well as in the places where we live, work, and play. This intriguing, up-to-the-minute book for scientists and nonscientists alike explains what researchers are discovering about the microbe world and what the implications are for modern science and medicine. Rob DeSalle and Susan Perkins illuminate the long, intertwined evolution of humans and microbes. They discuss how novel DNA sequencing has shed entirely new light on the complexity of microbe-human interactions, and they examine the potential benefits to human health: amazing possibilities for pinpoint treatment of infections and other illnesses without upsetting the vital balance of an individual microbiome. 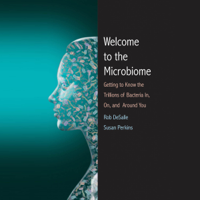 This book has been inspired by an exhibition, The Secret World Inside You: The Microbiome, at the American Museum of Natural History, which will open in New York in early November 2015 and run until August 2016. It will then travel to other museums in the United States and abroad.